Damon Edge, Helios Creed, and their fellow musicians create music that refuses to remain in the mainstream, yet waits nearby to invite the curious listener into its layered atmospheres. First off, this album is funded by Pledge Music, where fans donate to musicians seeking to release tapes or gain control over their songs. Guitarist-vocalist Helios Creed joined Chrome, proto-punk, Krautrock-influenced experimenters in San Francisco, as a teenager in the late 1970s. Drummer-vocalist-tape manipulator Damon Edge and he combined to form the band's best work. Creed left, while Edge sustained Chrome's name. After Edge's death in the mid-1990s, Helios Creed sought by pledges to regain rights to Chrome's back catalog. Creed bought back the selected songs on this recording, all unreleased from the period of Half Machine Lip Moves (1979) and Red Exposure (1980), apparently in a finished state. Grinding and harsh, eerie and unsettling. These terms often describe Chrome. Yet, as Creed remarks in the liner notes, accessible, nearly pop-oriented material entered their repertoire. After all, they were courted by Warner, eager to sign up by the '80s a somewhat amenable to new-wave set of San Francisco performers. 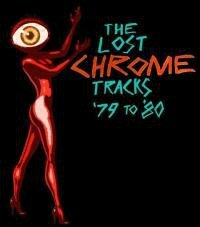 By the way, the Stench Brothers, rhythm section for singer Pearl Harbour (as her Explosions), backed Chrome for a while after the period documented on this 18-track compilation. "Anything" sounds like David Bowie's "Scary Monsters", warped; synthesizers chirp while melody lumbers. "Salt" also recalls Bowie's Lodger, with its Middle Eastern textures, crossed with a churning tape akin to Cabaret Voltaire's work during this period. "Looking For Your Door" mixes in an economic guitar riff before eventually adding keyboards for a danceable, if post-punk, downbeat delivery. Vocals alternate between Creed and Edge; both singers prefer gruff expression to croons or chants. "Going to surrender" drifts into "fantasy in the factory" before this phrase fades back to the song's title, all in the span of eight-and-a-half dutiful minutes. From such tracks, it's easy to see why goth-friendly label Cleopatra had issued so many of Chrome's later recordings. Yet, "Tomorrow Yesterday" and "The Inevitable" enter a spacious realm--if often claustrophobic due to the band's nature. The first jumbles rhythms while the second slows into a descending, measured pattern of guitar, drums, and distorted tape vocals. Much of this is repetitive, so those who are not fans of influences such as Hawkwind and space rock may race on to livelier selections. "Fukishima (Nagasaki)" promisingly combines propulsion with more forceful drumming and guitar. Current stoner-space rock bands such as Farflung surely must have listened to such tracks, somehow. The fact that this song does not sound as unfamiliar over three decades later attests to the subtle influence exerted by Chrome on contemporary musicians at the fringe. The livelier pace continues with "Charlie’s Little Problem" which allows more varied percussion than usual to enter the mix. If you like Om, you'll like this. These shorter, catchier songs, for me, energize this anthology. Just over two minutes, "Ghost" ushers in a revenant's appearance, with distended voice, of course, over whooshing effects. "Sound and Light" matches this in a well-sequenced segue into a louder, if also screechy, mood. The phased guitar rings with goth-tinged tones which Creed helped popularize. "Autobahn Brazil", again, compliments the work of Cabaret Voltaire's merging of dialogue and voices into more streamlined textures in this era. The song eventually opens into percussive ornamentation, rewarding a long wait. Not all of these tracks build up into a dramatic conclusion; Chrome prefers to play out an idea on tape. In more conventional but winning fashion, "Sub Machine" structures a churning riff above a straightforward hard rock base. "Morrison" brings a slightly grating background to offset the layers of voices tracked into a short song. For six minutes, "The Rain" stays steady. Like its title, it lulls. Creed praises "Something Rhythmic" as a harbinger of success. It shows an ear for the radio, alternating a basic keyboard chord progression with a guitar-drums chorus. But I imagine to gain airplay, it might have sounded the same at half of its four minutes without losing its intended effect. What might have been its novelty, one-off B-side? The Devo-ish one-minute "Housewarming Party". Who can resist a song named "Sugar Moog Pops"? True to its packaging, its synthesizers revolve around a simple drum pattern. Two-thirds in, the rocket reaches outer limits and the energy dissipates into an alternation of the lively and the languid. In fifteen seconds, "Intervention" comprises but one keyboard excerpt. Concluding, "Sunset" reminds me of Brian Eno's world-music instrumentals from his later solo albums in the 1970s. It points at a calmer, more integrated command of textures which depart from the more frenetic or leisurely tones of the preceding songs. I started out mentioning Chrome's work as more accessible than its avant-garde reputation may lead newcomers to believe. Half Machine From the Sun: The Lost Chrome Tapes '79-'80 attests to the ability of Damon Edge, Helios Creed, and their fellow musicians to create music that refuses to remain in the mainstream, yet waits nearby to invite the curious listener into its layered atmospheres.